Osama bin Laden was killed in Abbottabad in Pakistan on 2 May 2011, say the news reports. Really?! Or should I say—not again?! He’s been killed twice in India already! Once in 2006 and again in 2008. Yes, it made news splashes even then, although not as large a splash as his most recent death. Osama’s first death occurred in December 2006 in a tea estate in Assam in north-east India, at the hands of a hunter, a hired gun tasked with taking out the terrifying serial killer. And as if that was not enough, he was killed again in May 2008, in the Indian state of Jharkhand, at the hands of an empowered mob of government authority—the Forest Department and the Police. The second death was not easy. It took 20 bullets to silence Osama. And from the recent news, it seems even that did not work, after all. 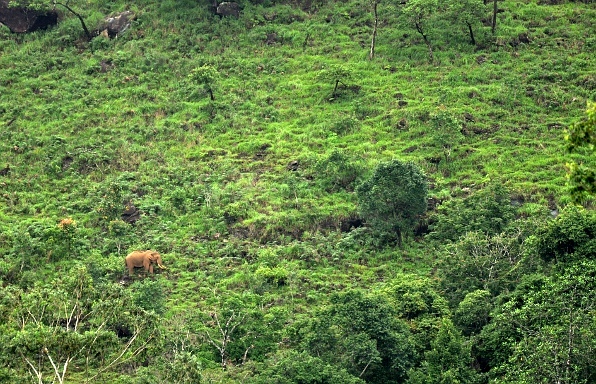 The painful truth is that the first two deaths of Osama referred, not to the terrorist mastermind and leader of al-Qaeda, but to two separate individual Asian elephants Elephas maximus, Asia’s largest land mammal, with the contrasting reputation of being the gentle giants of its forests. These individuals were named after a feared human, on the most-wanted list of a distant superpower. They were labeled serial killers and raging bulls, as rogues and as terrorisers. And yet, when people came to see the prostrate corpse of the killed elephant, they placed flowers on its body, even as many asked whether the right animal was killed or it was just another innocent elephant victim. Now, as before, it is open season on the Asian elephant. The character of the elephant is on public display in the media, interpreted to us by all manner of people. There are journalists and filmmakers, naturalists and scientists, politicians and hunters, mahouts and zookeepers, temple priests and elephant ‘owners’. Everyone knows, or seems to know, the elephant. From the forests come stories of great tuskers and makhnas and their roving lives of ranging and musth and disproportionate peril. There are tales of tenderness among mothers and calves, and of itinerant family herds led by rugged matriarchs over familiar routes across vast and varied landscapes. The stories speak of communication by unheard sounds, unfelt vibrations, and undetected pheromones, and of elephant memory and cognition. They speak of individuals that are self-aware and social, that can be doting or depressed, loving and forgiving. We learn of stable yet sensitive societies, and begin to know sentient and intelligent individuals. These stories proclaim an understanding of elephants that is barely beginning to grow. From crop fields and human habitation come tales of rogues and raiders, marauders and mayhem. There is an image of a lone tusker, willful and vicious, or of a huge herd on a rampage of raiding and pillage. The elephant tramples, the tusker gores, snuffing the lives of the few people whose path has converged tragically with its own. The elephants are not on old routes anymore; they are said to be straying herds, individuals on trespass. The words say it all. Each elephant and its action, known or unknown, is judged and placed within the ambit of a common belief. Pinioned by belief and judgement, claims and media reports, the elephants, unaware, must await retaliation. Retaliation and pain at the hands of the self-aware, social, sentient, and intelligent human. What does it take to cause pain to an elephant? That great beast, ponderous and thick-skinned, that stands tall in its calloused feet, but is still dwarfed by the immensity of its worldly landscape and its perpetual perils. Will it take a land mine, planted in a contested forest by warring people, which tears away its leg? Or the final body blow to an elephant on its path delivered by a speeding train that brooks no obstruction to its own? Will it be a flaming torch flung on its skin by an irate farmer, whose ire has overwhelmed his tolerance? Or perhaps the pain from the sting of an electric wire strung deliberately across land that someone now claims as his, and only his? It could come, too, from a bullet as it bursts its way into its heart or brain—from the gun of a poacher who wants only its teeth. Any of this may bring pain, and yet, the deepest pain to an elephant may come from the loss of one of its own. A pain we barely sense, far less understand, as we watch the elephant visit and caress the bones of the dead. We have arrived at a grim moment; one where we must, it is being said, rethink our tolerance and veneration towards the elephant, a relation that has spanned millennia. We must, it is being said, find ways to deal with the elephant, as one would deal with a troublesome pest, a pest spawned by an interaction between people and landscapes gone awry. The heart is the seat of a faculty, sympathy, that allows us to share at times the being of another. Sympathy has everything to do with the subject and little to do with the object… There are people who have the capacity to imagine themselves as someone else, there are people who have no such capacity (when the lack is extreme, we call them psychopaths), and there are people who have the capacity but choose not to exercise it. Elephants are merely mirroring the circumstances in which they have come to live… Under such conditions, human-elephant conflict (HEC) takes on a very different meaning. … issues surrounding elephants are “not about the animals”. Rather, they are about humans: human-elephant conflict revolves around questions of social justice and human introspection. Much like other cultures that have refused to be absorbed by colonialism, elephants are struggling to survive as an intact society, to retain their elephant-ness, and to resist becoming what modern humanity has tried to make of them—passive objects in zoos, circuses, and safari rides, romantic decorations dotting the landscape for eager eyes peering from Land Rovers, or data to tantalize our minds and stock the bank of knowledge. Elephants are, as Archbishop Desmond Tutu wrote about black South Africans living under apartheid, simply asking to live in the land of their birth, where their dignity is acknowledged and respected. One is forced to wonder what the future holds for the human – elephant relationship, a relationship between two intelligent, sentient species. Will it remain a perception of elephants as objects of conflict seen through the lens of science, when it could lead to coexistence if passed through the prism of humanity? Can feel your pain. I know what you mean when you say that ‘their deepest pain comes from the loss of their own’..
A story I wanted to share about empathy..Taya Tayum had been a hunter all his life in the forests of Pakke..after years of hunting, slowly came a change of heart. One monsoon morning he was at the river bank close to his hut..the river was swollen..he saw a herd of elephants crossing over to the other side to the sanctuary..a small calf could not make it..it was struggling in the water..the herd watched from the other side showing their distress, not leaving, not knowing what to do. He watched for sometime, then could not take it any longer. He called out to his wife, children, brothers, their wives and they got a long rope. He took the rope with him and the family held on to the rope while he waded into the middle of the deep swirling waters, reached the calf, tied one end of the rope to the calf and all the family pulled with all their strength to get the calf out, while Tayum held on. The calf was ultimately brought up in the DFO’s bungalow..and maybe some people would say this sort of rescue/interference/sympathy for one animal is not needed. But the empathy that Tayum & his family showed is ultimately what’s needed for the elephants’ future. Tayum & his family have lost their meagre rice crops every year to elephants and later all their land to a flood (they have stopped cultivating and now buy rice, as do many other Nishi families) yet he still felt empathy for the elephant family. There was also a story a couple of days back on the back page of the Hindu about a place in Kerala where despite constant elephant presence & movement..people & elephants co-exist peacefully.. wonder how & why..the key thing seemed to be that people had accepted them as part of their landscape..it was a nice change to read, dunno how true it is..did you see it? Thanks Aparajita, for that story. With a well of human empathy and understanding lying just under the surface, conservationists would do well to draw on it as much as they do from science and economics to address elephant conservation and conflict issues. And you are right that this is often embodied most in the people directly affected by the consequences of the ‘interaction between people and landscapes gone awry’. Very heart-wrenching article Sridhar! This reminds me of a recent incidence from Gibbon WLS, where a bull was hit by a train and injured himself badly to a point that he was not able to walk properly. After sustaining weeks of agonising pain, finally he was succumbed to his injuries. I am wondering how many times he must have endured his assassin’s whistles and how much it might have shattered him to the core. Beautifully written Sridhar! Tugs at all the right emotions. Hope this reaches a much wider audience. Very well written Sridhar. 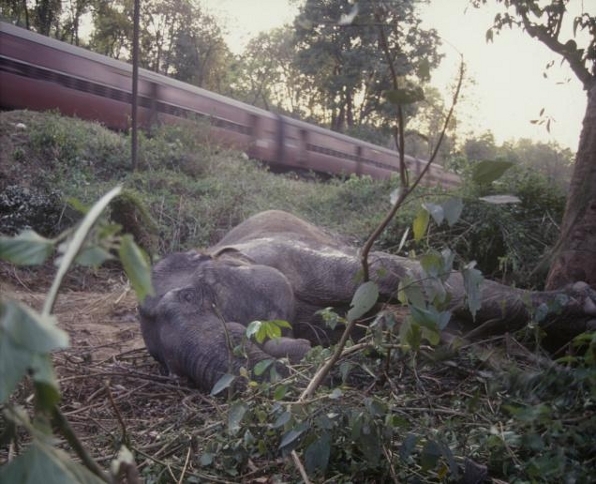 I witnessed a Elephant accident in the forest of North Bengal when I was a kid. She had a calf and the calf was roaming around. This sight left a mark in my mind and led me to studying wildlife eventually.. I can totally relate to this post. Thanks for sharing. It amazes me when I run into people who cannot believe that animals can have emotions and think that the word “emotions” is a human concept! Sridhar, I avoided reading this article for a whole week because I thought it had something to do with Osama in spite of the plural ‘deaths’.. Stunning piece.. and like PB says, it should reach a larger audience..
and before i read your response to her.. i knew where the first ‘anonymous’ comment came from too.. inimitable style.. huh? Thought provoking article. The future of Elephants will only be secure when humans stop trying to make them fit in with what is convenient for humans. Thanks for all the comments. Today, an edited version of this article appeared in the Deccan Herald: http://www.deccanherald.com/content/163574/death-two-osamas.html. Today, also, an international meeting at New Delhi deliberates on elephants and elephant conservation in range countries. Here’s hoping that a new vision will evolve and elephants will be seen in a fresh light!